Despite historical fire and structural safety concerns, the modest, tall wood buildings movement of the last few decades is picking up steam in Canada. To provide a framework for architects and builders, the Government of Ontario published a (free) guide in October 2017, Tall Wood Building Reference: A Technical Resource for Developing Alternative Solutions under Ontario’s Building Code. 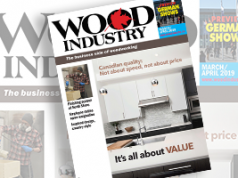 FPInnovations of Pointe-Claire, Que., a Canadian primary and secondary wood manufacturing research organization, has had its 2014 Technical Guide for the Design and Construction of Tall Wood Buildings in Canada for sale since 2014. 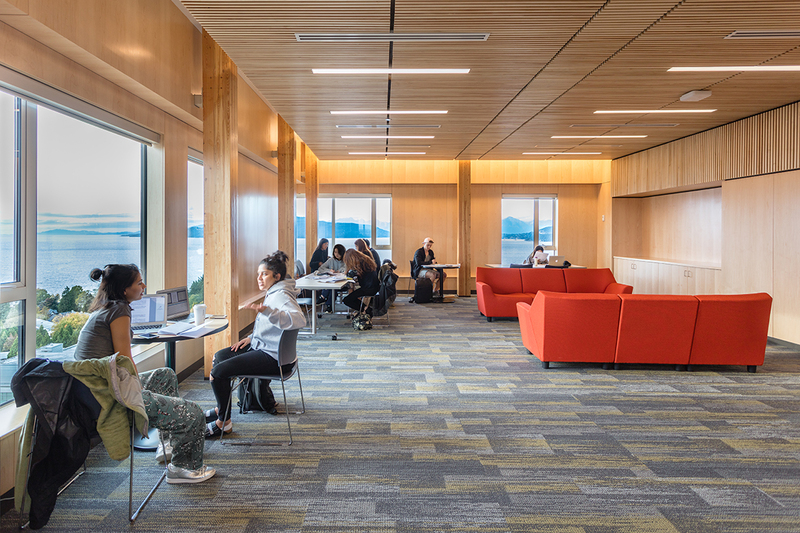 British Columbia and Quebec have also approved designs and issued building permits for buildings that exceed the six-storey limits using other mechanisms in their building codes. Building tall in wood is not a new phenomenon, according to FPInnovations. 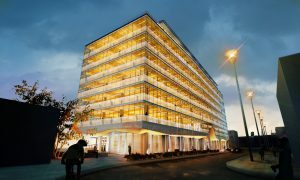 In fact, it says, Canada has a history of constructing tall wood buildings out of heavy timber and brick elements, reaching up to nine storeys. “In the early 20th century,” states FPInnovations, “with the increase in reinforced concrete and structural steel research and construction, and with growing concerns over fire and durability, the structural use of wood fell out of common use in tall buildings. The technical guide from FPInnovations was prepared by a group of experts to assist architects, engineers, code consultants, developers, building owners, and Authorities Having Jurisdiction (AHJ) in understanding the unique issues to be addressed when developing and constructing tall wood buildings that are beyond the height and area limits currently found in the National Building Code of Canada (NBCC). 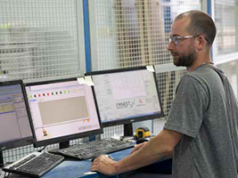 The Canada guide also provides design and construction teams with the concepts and background to respond to questions that arise when designing beyond the height and area limits prescribed by the NBCC. 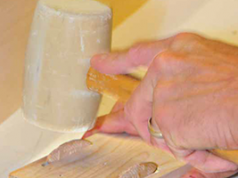 Mass timber offers the advantages of improved dimensional stability and better fire performance during construction and occupancy, notes the Ontario guide. “Tall wood buildings are not new to Ontario — many such buildings are still in use in Ontario after nearly 100 years in service, however over time, changes to building codes and the introduction of steel and concrete for high-rise construction resulted in a decline in construction of tall wood buildings over the decades. 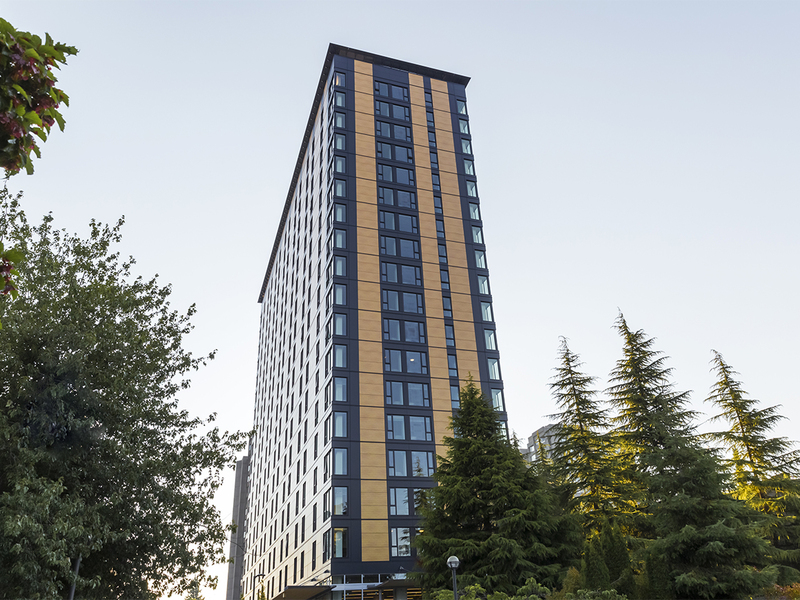 One tall wood building construction project that stands above the rest in recent years is the Brock Commons Tallwood House completed in 2017, an 18 storey, LEED Gold target, 404-bed student residence building located at the University of British Columbia (UBC) in Vancouver. 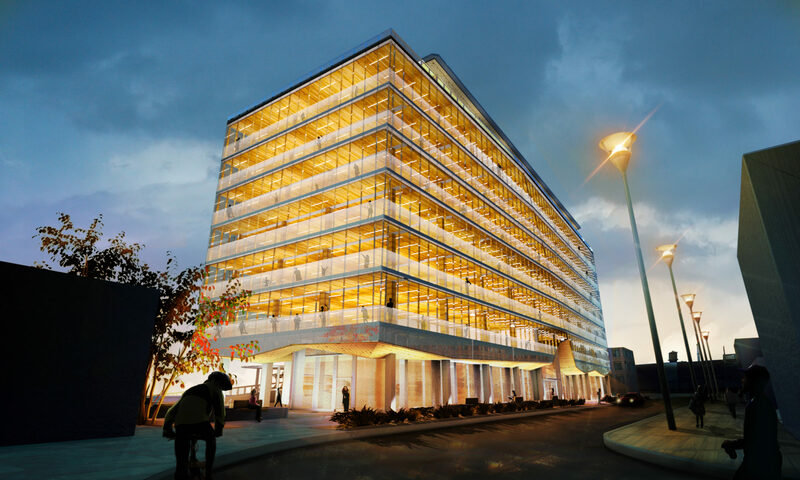 And coming soon at just seven storeys — one storey above the provincial code tall wood definition — 77 Wade Avenue, located in Toronto, Ont.’s Bloordale Village, will be a prototype for a mid-rise (between six and 10 storeys) office building, using a hybrid structure including mass timber. The approach to the building is unified with an origami geometry soffit and organic front entry, retail and flexible collaboration spaces, states BNC. Perched above the form is a wood canopy that creates shading for the outdoor amenity/social space, it adds. “A prefabricated facade, arranged in a pattern of vertical striations, features pre-installed windows and cladding consisting of 70 per cent wood fibres. A metal cornice crowns the building. A CLT canopy runs the length of a curtain wall base, which reveals the warm wood finishes of amenity spaces within.